Fall Season games for Lighthouse Soccer Club Boys & Girls Travel Teams begin in September, and training for all fall teams is currently underway. Lighthouse Soccer Club is always accepting new players but placement with a specific team depends on availability. New Players: If you do not have a team or coach assigned already, please complete the New Player form. Registration fees are $200 for one player/family; discounted rates of $275 for two players/family and $350 for three players/family are automatically applied. Use this form if you have already been assigned to a team's roster. You will be asked to provide the team name and coach of your assigned team. If you DO NOT have a coach and a team but would like to be contacted for possible try out opportunities, please Click Here. Please complete and submit the form below to send us your travel team registration. We'll be in touch shortly. Information sent through this form is protected with 256-bit SSL encryption. Lighthouse Soccer Club requires that you disclose a primary medical insurance carrier. 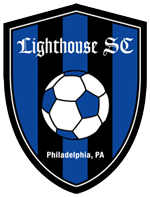 Failure to comply will disqualify applicant from participating in Lighthouse Soccer Club programs. I, the parent/guardian of the registrant, a minor, or adult registrant of legal age, agree that I and the registrant will abide by the rules of the EPYSA, it’s affiliated organizations and sponsors. Recognizing the possibility of the physical injury associated with soccer and in consideration for the EPYSA accepting the registrant for its soccer programs and activities (the “Programs”). I herby release, discharge and/or otherwise indemnify the EPYSA, its affiliated organizations, and sponsors, their employees and associated personnel, including the owners of the fields and facilities utilized for the Programs, against any claim by on or behalf of the registrant as a result of the registrant’s participation in the Programs, and/or being transported to or from the same, which transportation I herby authorized. Lighthouse Soccer Club REQUIRES ALL FEES TO PAID ONLINE AT THE TIME OF REGISTRATION. However, if your family is currently experiencing hardship, alternate payment arrangements may be possible. Please complete my payment online. I have a financial hardship and I'd like to discuss alternate payment arrangements. This form must be signed by a parent/guardian for minor player or by an adult player. ALL FEES MUST BE PAID ONLINE AT THE TIME OF REGISTRATION. When you submit this form, you will be taken to PayPal where your payment will be securely processed. There is NO COST incurred by you for paying online. No credit card or PayPal information is stored on this site or seen by Lighthouse Soccer Club at anytime. Everything is processed securely by PayPal, who automatically encrypts your confidential information in transit from your computer to theirs using the Secure Sockets Layer protocol (SSL) with an encryption key length of 128-bits (commercial grade). Before you even register or log in to the PayPal site, their server checks that you're using an approved browser - one that uses SSL 3.0 or higher. For more information regarding the security of PayPal, please click here.